Hello and thanks for for dropping in! 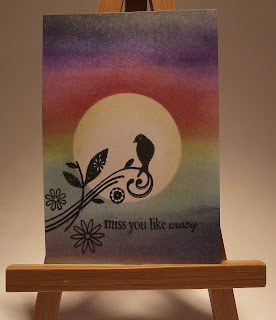 I made this ATC for the Ditzy-Craftymessers Daily Challenge - Stamps and Masking . I punched a one inch circle from a piece of paper and using removable adhesive, placed the circle when I wanted the the 'moon'. Working through the colours of the sunset from yellow to black I layered the inks with a cosmetic sponge until I had the effect I wanted. The branch and bird where stamped separately in black ink, The ATC was finished with the sentiment stamped in black. I like this little thing and I'm pleased with the result.